Paleontologist Kate Lloyd joins a Norwegian scientific team that has stumbled across a crashed extraterrestrial spaceship buried in the ice of Antarctica. They discover a creature that seems to have died in the crash eons ago. 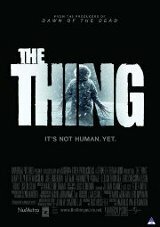 When an experiment frees the alien from its frozen prison, Kate joins the crew's pilot, Carter, to keep it from killing and imitating them one at a time, using its uncanny ability to mimic any life form it absorbs through digestion, and potentially reaching civilization.